Team taste designers are at it again, fulfilling projects in all phases of the design/construction process as we enter into a busy late fall & winter season. We’re so appreciative of New England’s seasonality and the added focus that comes this time of year in our coastal, summer community. As we say goodbye to snowbird clients until next Spring, our heads are down in the studio and our boots are on in the field — preparing homes for the next summer season and for many, the next chapter of their lives with their families. As always, we aren’t alone in our commitment to creating well-considered, well-crafted homes for our clients.  We are side by side with accomplished architects, builders and craftspeople all working together, with the same ethos. When the days get dim and the temperatures dip, its these relationships that brighten our work and deliver a laugh – together. Snapshots follow below from the studio and the field. Check back next week for a peek at a few more projects underway and all benefiting from our hunkered-down focus this fall. Kevin Kevin’s leading the renovation of a classic Jamestown cottage, bringing together historic design details with energy efficient, advanced building practices. Our designs started with perspective views of the interior and exterior prepared in Sketch-up, coupled with detailed drawings produced in CAD. The trades are on-site now, roughing in plumbing and electrical in preparation for insulation in a few weeks. Walls will be plastered in another month, providing a warm environment for interior finishes this winter and completion in the Spring. Candy There are deadlines and then there are yacht design deadlines. Candy’s working alongside The Fontaine Group on a refit of a classic yacht in time to set sail in early December. (A yacht is a bit different from a residence – when it sets sail, its gone. There’s no returning to the house in a few weeks to add a piece or two that’s been delayed!). Furnishings are in production, the pewter bar top is being crafted, joinery is in the finishing stages and the art has arrived. We will make the deadline, beautifully. Wendi Wendi’s recently back from a well-deserved vacation in France with her husband, Peter. (They are the most high energy, spirited empty-nesters you’ll ever meet!). After trekking through the streets of Nice and Paris on bikes and mopeds, Wendi returned inspired and ready to infuse her projects with European quality and timelessness. Coincidentally, we’ve started working with a client to renovate their new/old French-inspired home, providing the perfect opportunity for a palette of limestone, weathered wood, brick, iron and aged brass. Julia If you’ve bumped into Julia recently, you’ll know she’s expecting baby #2 in February — although you wouldn’t know that from her energy level. More than ever, she’s bringing her high-spirited, love of design to her client projects, including a new construction home Patrick Ahearn home in Weekapaug, Rhode Island. We love our client’s self-described affinity for ‘spritely’ fabrics and colors. Julia’s sense of style and ability to artfully compose a scheme is delivering just the right amount of spirited sprite to this coastal home. 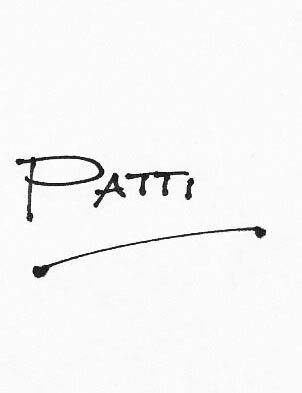 Patti As for me, I’m re-energized by recent design industry events that have given me a renewed focus on improving our design deliverables and ultimately, the client experience. Let’s face it, a renovation or new build project is an intense experience for our clients. They don’t do it everyday as we do. More than ever, I’m dedicated to bringing the best talent, tools and project management to our clients so that they may find joy in the process of creating their home. And, leave the worries to us. Most importantly, I’m practicing this recommitment everyday while I lead projects ranging from the completion new construction coastal homes, to the renovation of a Normandy-inspired family home to the rework of a Kitchen for fellow designers I admire. It doesn’t get much better than this. We were at it again last week, finishing a custom residence and welcoming clients to their new home by the sea. This move-in was especially gratifying for us after working for the past two years alongside Horan Building Company on this Alec Tesa designed home. In addition to designing the interior millwork, cabinetry and hard finishes throughout the home, we selected – and in several rooms – designed custom pieces specifically for our truly special clients. Be sure to pause on the curved sofas with exposed hardwood frames in the Living Room and the Dining Room chandelier, to mention just a few of the pieces designed by taste and brought to life by local craftspeople and artisans, to whom we’re most grateful. As gratifying as it was to see the finishing touches on this project come together exactly two years after we started, those moments paled in comparison to our clients’ reaction to their new home. Their embrace of each other on Friday evening as they watched the final elements installed said it all. To quote them, its their ‘home for the next chapter of their lives’. We’re so honored to have been involved in this important, life-shifting project. As always, finish photos to follow in the coming months. Enjoy the snapshots in the meantime. George and his associate Catherine (Cat) Young have designed a perfectly scaled second home for our Connecticut clients and their active family, who have summered in the Charlestown, Rhode Island neighborhood for years. With views to the marsh and a short walk to the beach, the house is located in an idyllic coastal neighborhood and carries a skillful design that respects the local community while answering our clients’ wishlist. Add to that well-considered details inside and out, abundant natural light and ease of flow from interior to exterior spaces, and you have a dream home in the making thanks to Penniman Architects. And just when you think the project can’t get any better, our thoughtful client arrived today with lunch for the entire crew led by master builder Gardner Woodwrights — a consummate builder if I’ve ever met one. Snapshots from today’s visit, along with a favorite house designed by Penniman follow below. I’ll keep you updated as we collaborate on this project in the coming months, in good company and with great pleasure. A view into the Kitchen’s breakfast nook. The plumbers were on-site today, applying some elbow grease to the project. A view into the Sunroom. The afternoon sun setting on the Sunroom and Master Bedroom above. The front elevation, complete with eyebrow roofline. A view to the marsh. I had dinner at the Weekapaug Inn in Westerly, Rhode Island last week and while there, was reminded of the rich summer house tradition that serves as a foundation in the project work we do. 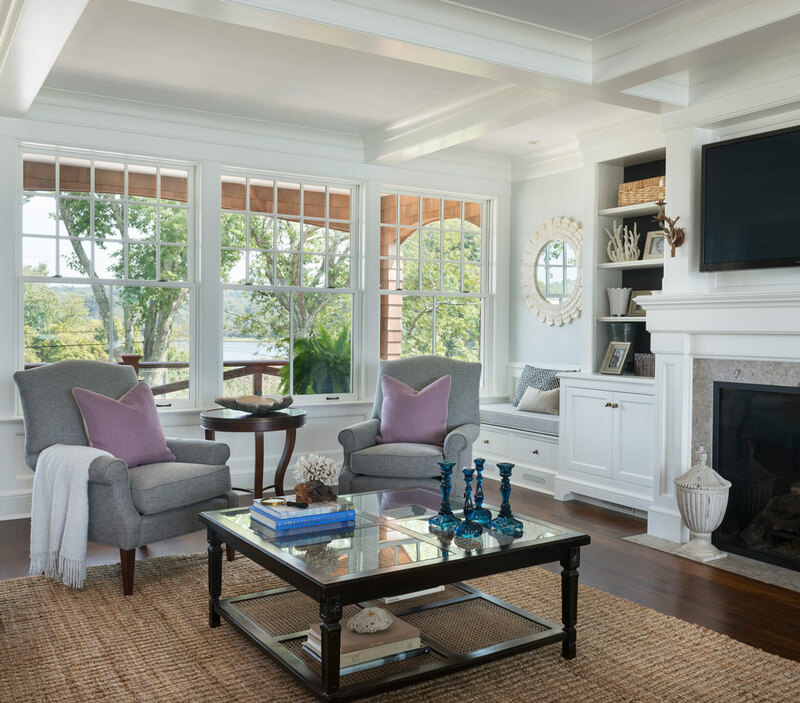 The Inn, beautifully designed and appointed by Taylor Interior Design, feels like a classic shingle style summer residence iconic to the Rhode Island coastline. Upon entering the lobby, your pace immediately slows, manners improve and conversation flows. There isn’t a screen or monitor to be found at the bar or in the lobby – just comfortable places to gather, connect and converse. Weekapaug Inn. Architecture b Arris Design. Photo by tripadvisor. Weekapaug Inn Lobby. Interior by Taylor Interior Design. 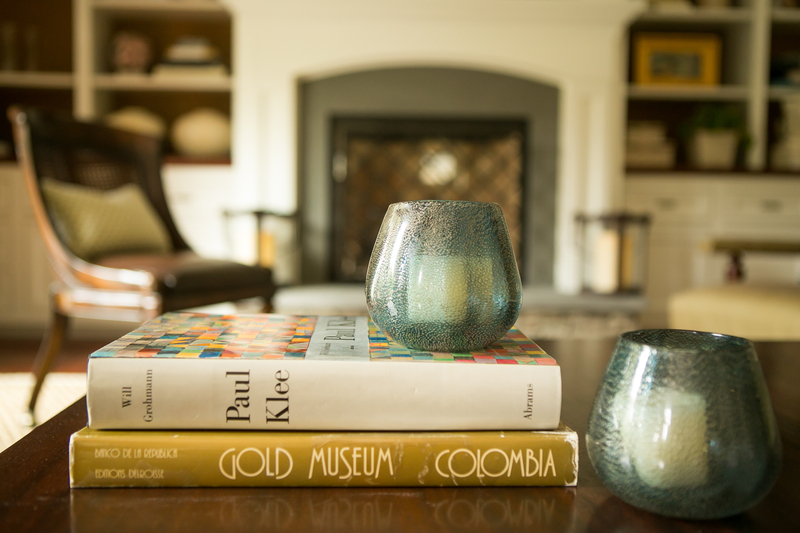 We strive to bring these same qualities to the summer homes we design – laid back living that encourages relaxation, but never forsakes style. Finely crafted, beautiful details set the scene for sink-into sofas and chairs with a table for every drink and a lamp for every book to be read. Even a game table for those chess games that only seem to happen during long, lazy summer afternoons. Wishing you summer days that let you slow down, in style. 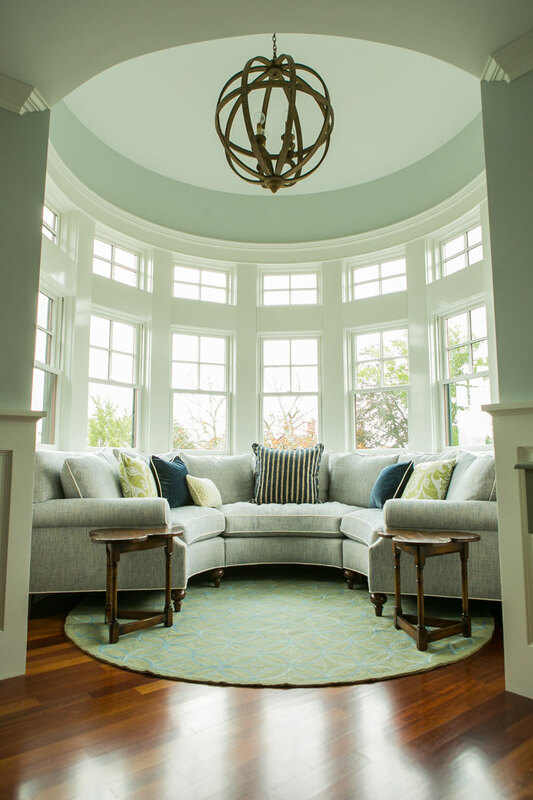 A custom sectional takes the shape of the turret that overlooks the water in this Newport home. Interior by taste. Photo by Robyn Ivy. A Newport Living Room ready for the season. Interior by taste. Photo by Robin Ivy. 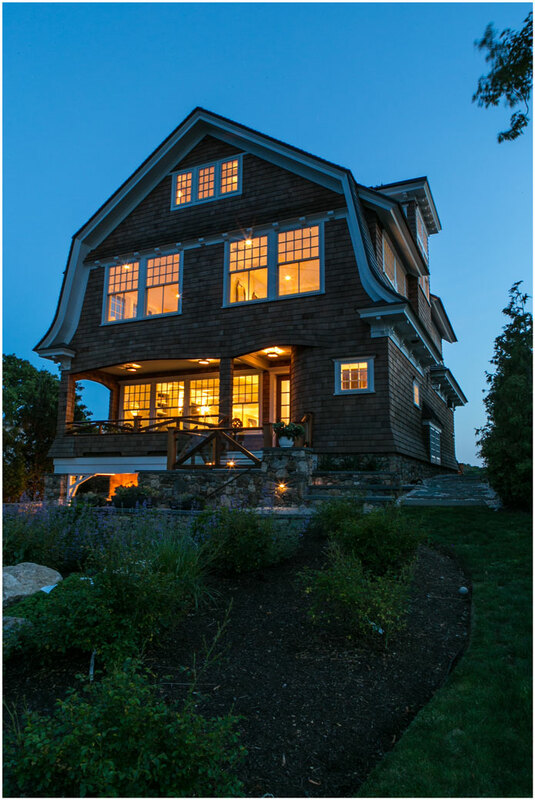 A Narragansett shingle style home with views of the water from the front and back porches. Architecture by Leslie Architect; Interior by taste; Photo by Nat Rea. A coffered ceiling and classic millwork delivers a traditional style, with pretty details. Interior by taste. Photo by Nat Rea. 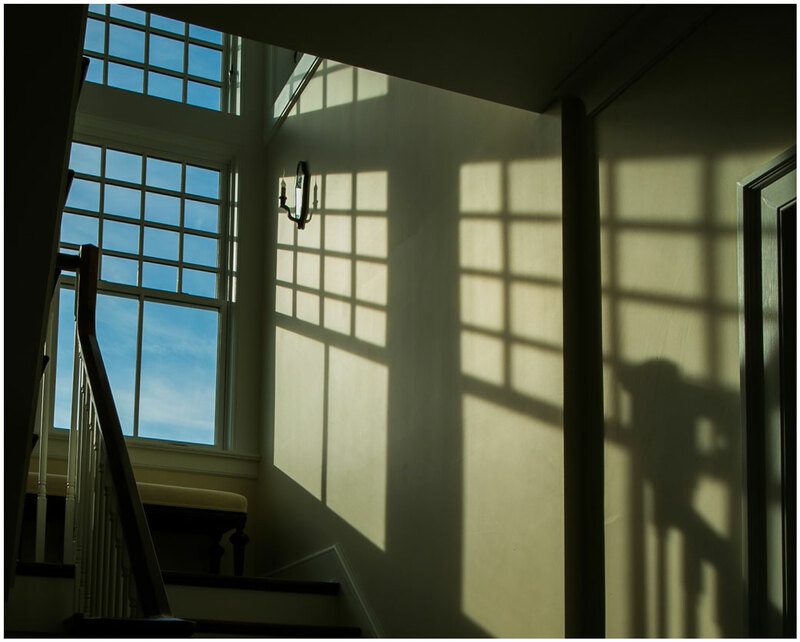 The summer sun setting in the stairwell. Interior by taste. Photo by Robyn Ivy. 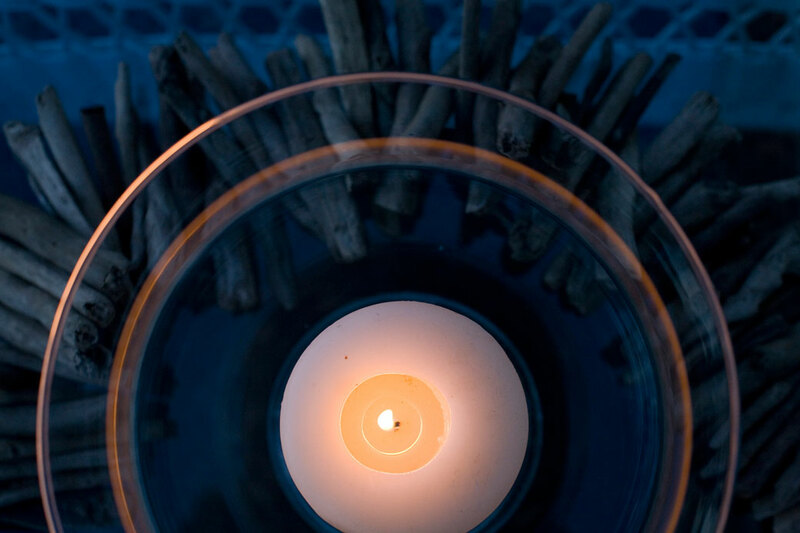 Beachside candle light. Photo by Robyn Ivy.